Flavius Anicius Petronius Maximus became on of the most prominent Senators in Rome under the reign of Honorius. Petronius was of noble birth coming from one of the great senatorial families in Rome – the Anicii. Petronius was a very ambitious man and he made his bid for supreme power in 455 AD. Already in his sixtieth year (born 395 AD), Petronius headed a conspiracy which led to the assassination of Valentinian III in Rome on March 16, 455 AD. Petronius was proclaimed Emperor the following day. Petronius felt vulnerable in the aftermath of his plot. In order to help legitimize his position, he forced Valentinian’s widow, Licinia Eudoxia to marry him. Thus Licinia was forced to marry her husband’s murderer. This political move outraged many. Licinia wrote to Gaiseric, the Vandal King in Carthage, North Africa, to plead for him to overthrow Petronius. Gaiseric was happy to help and in the process, he planned to sack Rome. With an attack from North Africa on the horizon, Petronius tried to flee Rome. As he was on his way out of the city, he was attacked by a mob of citizens and killed on May 31st, 455 AD after a reign of scarcely more than two months. Coinage of this Emperor is quite rare given his short reign. The only denomination known to date is that of the gold solidus. No silver, bronze or less gold denominations have been discovered. Marcian was an accomplished soldier of humble origin who fought against the Persians. His father was also a soldier from the Balkans. Marcian became a widely respected tribune under Theodosius II. There are two versions of his eventual rise to the throne. One version claims that Theodosius had a vision in which he saw Marcian as his successor. 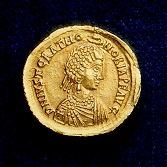 The other version claims that following the death of the Emperor Theodosius II, the right to select his successor fell to his wife, the Empress Pulcheria who selected Marcian to be raised to the rank of Augustus. In any event, Pulcheria may have carried out the wishes of her dead husband rather than rely upon her own choice. Whatever the case, Marcian and Pulcheria were married and Marcian succeeded to the throne of the Eastern division of the Roman Empire at Hebdomon on August 25th, 450 AD. The union between the two was purely political and Pulcheria took a vow of chastity. Pulcheria’s influence was clear. One of the first acts of Marcian was to execute Chrysaphius Zstommas, a longtime rival of Pulcheria. This proved to be one of the few bloody acts performed by Marcian during if reign. Marcian did prove to be a wise choice on the part of the Empress. He proved to be generous, wise and noble and his reign ushered in a brief age of peace for the Eastern Roman Empire. Marcian ended the tribute that had been paid to Attila the Hun for not invading the Eastern regions of the Empire. Instead, Marcian said that he had no more gold for Attila – only iron. Marcian became a fiscal reformer which proved to be very successful. By ending the gold payments to Attila the Hun, the savings to the treasury were significant. Marcian then combined this added revenue with a government reform process in which expenditures were reviewed and reduced. The net results of these economic reforms sparked a new age of growth and prosperity as the treasury of the Empire began to increase for the first time in decades. Back taxes were collected, relief and repairs instituted due to numerous natural disasters. Stability and economic sanity had at last been restored. In 455 AD, Marcian refused to support Rome against the attack of the Vandal King Geiseric. This decision was very unpopular in the East. However, Marcian’s decision proved to be the correct one holding onto and rebuilding the resources of Constantinople. In 451 AD, Marcian called the Fourth Ecumenical Council of Chalcedon within the Church. It was this meeting where the political struggles for power within the Church also began to reflect what had taken place within government. The patriarch of Constantinople pushed for more power and in effect was afforded virtual equal status with that of the Pope who still resided in Rome. This began the split of the Church between East and West. Marcian died peacefully of natural causes in 457 AD at the age of 67. His wife Pulcheria died four years prior in 453 AD. With the death of Marcian, the house of Theodosius came to an end. 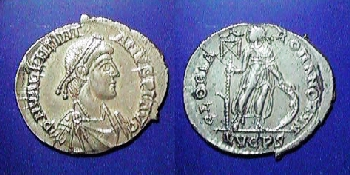 Justa Grata Honoria was the daughter of Constantius III and Galla Placidia, which made her the granddaughter of Theodosius I. Honoria was given the rank of Augusta by her brother Valentinian III in the Western Roman Empire. She died shortly before the murder of her brother byPetronius Maximus in 455 AD. The only coinage known of Honoria is that of the traditional gold denominations of the later Roman period. No silver or bronze denominations have been discovered to date. Placidius Valentinian III was born in 419 AD the son of Constantius III and Galla Placidia. Placidia fled from the court of Honorus at Ravenna in 423 AD when her half-brother began to take an interest in her. She took her children to the court of Arcadius, her other half-brother in Constantinople. 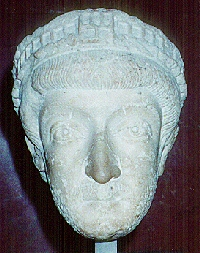 Eventually, her son Valentinian III was married to the daughter of Theodosius II, Licinia Eudoxia which thus marked him as the heir to the Western throne. Following the death of Honorus and the defeat of the usurper Johannes, Placidia took her son back to Italy where he was proclaimed emperor with the scantion of Constantinople on October 23rd, 425 AD. For the first 12 years of Valantinian III’s reign, his mother Placidia ruled the Western division of the Empire as regent. Thereafter, the control of government passed from her hands to that of the general Aetius who maintained control until his assassination in 454 AD. Valantinian III’s primary interests in life were sports, religion and seducing other men’s wives, and if he had perhaps restricted himself to those simple pastimes his reign might have been more successful. Under Valentinian’s reign, the Western Empire continued to decay. His greatest disaster was the loss of Africa to the Vandals. In 451 AD, Attila the Hun invaded Gaul, but his competant general Aetius and his Visigothic allies proved victories over the Huns at the famous battle of Mauriacus. Perhaps Valentinian’s greatest political mistake was the murder of his most successful general, Aetius in 454 AD. This was the crowning stupidity of the Theodosian dynasty, and resulted in his own assassination six months later by the ambitious senator Petronius Maximus. Aelia Pulcheria was born in 399 AD the daughter of Arcadius and Eudoxia. On July 4th, 414 she was raised to the rank of Augusta and assumed the regency when she was only 15 years old on behalf of her younger brother Theodosius II. Aelia Pulcheria was the true power behind the throne. 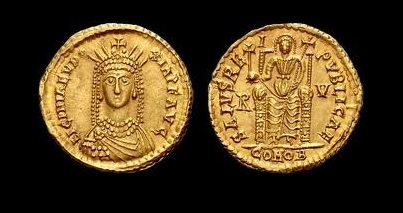 Theodosius II had no ability to speak of and Pulcheria became the effective ruler of the Eastern division of the Empire. Virtually all the reforms and building projects were her design leaving her brother not much more than a figure-head. Pulcheria exercised her control in all matters even selecting her brother’s wife. She maintained her control of the state until her brother died in 450 AD and even then she decided who would be his successor. Pulcheria died in July, 453 AD leaving all her worldly possessions to the poor. All of Pulcheria’s coins were struck in Constantinople, and for the most part parallel the issues of Theodosius II. The obverse of her precious metal coins all carry the same legend and all depict the hand of God. The prominent cross on this reverse type was introduced by Pulcheria and the Vota on her coins are those of Theodosius II. Aelia Eudocia was the baptismal name given to Athenias, daughter of the Athenian sophist Leontius and reputedly one of the most beautiful and brilliant women of the age. Eudocia had been picked by Pulcheria to become the wife of her brother Theodosius II whom she married in 421 AD. Her relationship with her sister-in-law ultimately was a stormy one, and in 440 AD she retired to Jerusalem to a life of piety and church building. Eudocia died on October 20th, 460 AD.